Should Denver pursue a trade for Anthony Davis? 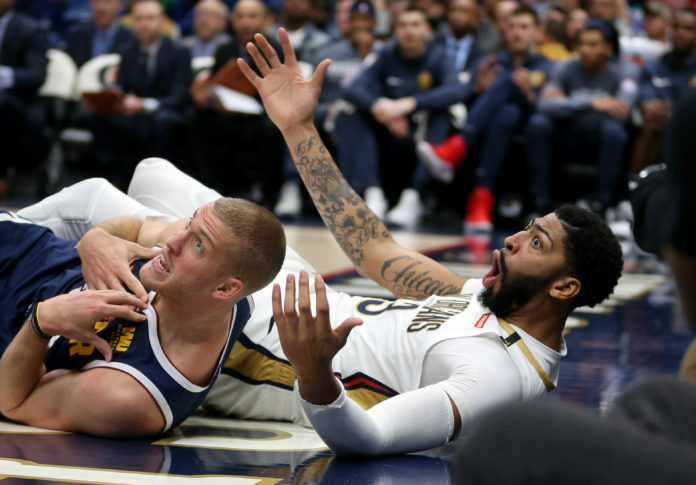 With the New Orleans Pelicans being forced to move on from six-time All-Star and three-time All-NBA first team talent Anthony Davis, should the Denver Nuggets pursue a trade? As the trade deadlines looms — 1 p.m. MST on Thursday — should the Nuggets attempt to acquire one of the NBA’s most transcendent players? Or should they stand pat and roll with the roster they have in place for the rest of the season? The scribes at Mile High Sports got together to examine that and more in our latest roundtable where we discussed whether or not Denver should try and acquire Davis ahead of Thursday’s NBA trade deadline. Do you think the Nuggets should trade for Anthony Davis? T.J. McBride: Denver has to entertain the idea. There may never be another opportunity for the Nuggets to pair together two top-ten players, but with that being said, there would have to be some caveats. 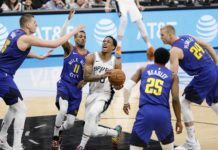 Without a guarantee that Davis would stay in Denver (which he will not provide), there is no way that the Nuggets can include their entire starting back court. Inversely, if there was a pathway to Denver adding Davis while keeping one of Jamal Murray and Gary Harris, that is something the Nuggets need to pursue. This is Anthony Davis we are talking about. The Nuggets potential is unquantifiable when pairing Jokic with Davis. Dev Johnson: I am conflicted on how I feel about the Nuggets trading for Anthony Davis. If the Lakers gave the ‘godfather offer’ and it was still rejected, what will the Nuggets have to give up for Davis? New Orleans does not feel as any rush to get a trade done considering that the Celtics cannot involve themselves, and potentially an offer including Jayson Tatum, until July 1st and no one knows if the Knicks will end up with the first pick in the draft and, in turn, Zion Williamson. Why would the Pelicans make a trade without either of those potential offers on the table? Not to mention, the Nuggets have been great this year and are on pace for an historic season despite being ravaged by injuries. If it is not broken, do not fix it. Stay out, Denver. Brandon Ewing: No, and here is why. Is Anthony Davis one of the top 10 players in the NBA? Absolutely. But, he is not a fit here in Denver with the Nuggets considering all of the players and picks they would have to part with to obtain him. The reason for that is because of the culture Tim Connelly and Michael Malone have already built with their current roster. Denver’s team is full of home grown talent and players that have developed within the organization. Why mortgage the future when the future is already so bright? When Davis becomes a free agent next season, it will be hard to get him to re-sign here. That is not because of what Denver has built — the Nuggets have a solid foundation — but it based off the idea of Davis wanting to play in a bigger market. If the Nuggets gave up the type off prospects it would take to land Davis, they would be taking a huge risk on the future of the franchise. What would be too much to trade for Davis? T.J. McBride: As I said before, including both members of the back court will likely be where they draw the line, but it may actually be even further than that. I would say that a hypothetical deal where Denver sends out Harris, Murray, and Michael Porter Jr. plus multiple first round picks is too much. There is a world, regardless of how unrealistic it seems, where Denver pushes their chips to the center of the table to get Davis by sending out both Harris and Murray, but sending out three blue-chip prospects and multiple first round picks is just too much. Dev Johnson: Just the idea of Nikola Jokic next to Anthony Davis is something to dream about. How amazing would that be? They would be the top big-man duo in all of basketball, they would make each other better, and they would be immediate championship contenders. But what happens to the rest of the team? By taking a look at the ‘godfather offer’ from the Lakers that was rejected by the Pelicans, it can be inferred that Denver would have to give up multiple players that make up their core as well as a draft pick or two. That is too much. Denver should take a look at how spectacularly this season has gone and all of the successes that have come with it. Obtaining a superstar player of his caliber would be awesome, but is it worth risking the future for? Brandon Ewing: Any deal that involves Nikola Jokic, Jamal Murray, or Gary Harris would be to much to give up for Davis. You can go as far as to say that Michael Porter Jr. would even be to much to give up as well. 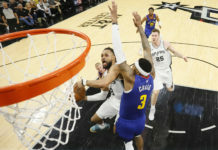 It would also be tough to part with players like Malik Beasley or Monte Morris, who have all played such instrumental roles in Denver’s success this season. A deal would most likely not get done with New Orleans unless one or two of those players mentioned above is included, which brings me back to my original point. Is it really worth blowing up the fantastic roster the Nuggets have built? Absolutely not, because it would cost the Nuggets way to much and could derail them from all the hard work they have put in these past four seasons to get them too where they are today. Would you make the trade even if he does not give any guarantee that he will stay? T.J. McBride: Absolutely; so long as Denver only includes only one member of their starting back court. Again, Davis is a top-10 player who would turn Denver into an instant contender. There is one other interesting thought process — a wrinkle, so to speak — that exists when trading for Davis. Whichever team makes a deal for him will still have him under team control throughout the 2019-20 season which means they could trade for Davis and then turn around and flip him to another team during the summer. If Denver did trade for him and Davis still refused to sign in Denver, the Nuggets could then trade him themselves for a haul. Maybe the Nuggets could send Davis to the New York Knicks, if they won the draft lottery, to get their hands on Zion Williamson to pair with Jokic. Maybe Denver could trade Davis to Boston so that they could get their hands on Jayson Tatum. The point is that if there is a route to a deal that only includes one member of the starting back court, Denver should do it because of all of the different possibilities that exist. Dev Johnson: I would definitely not make the trade without a promise from Davis. When you make a deal that requires so many young players and picks, it has to be for something that will surely stick. Anthony Davis is a player that you give up plenty for and build around, but when you are a team like the Nuggets that has been knocking on the door for so long and are finally exactly where you want to be, you do not just give up on what got you there. There are probably plenty of teams in the league that would give it all up, but the Nuggets organization should be happy with what they have built. Brandon Ewing: The only way you make the trade is with the guarantee he will stay. If Davis provides no guarantee to singing long-term in Denver, you hang up the phone immediately. For what it is going to take to acquire Davis, there is no way you can make a trade without a long-term commitment. 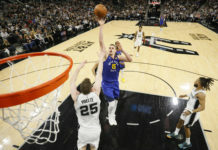 Even if you get a year and a half of Davis in a Nuggets uniform, it still may be tough to knock off the Warriors, and then was happens next season if Davis leaves? You just lost a star player on top of everything it took to acquire him, which is why Denver should stand pat and let the rest of the NBA fight it out for Davis’ services.